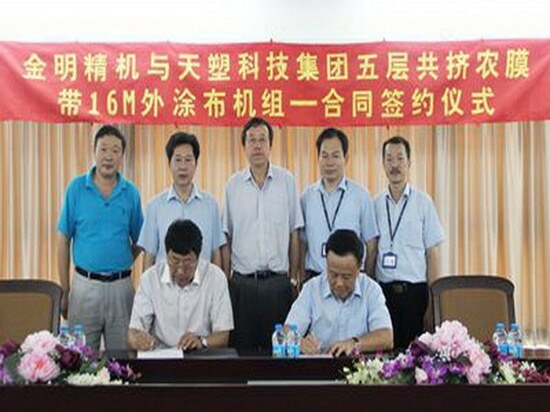 Jinming Signs Contract With TPSTG for Asia‘s First 16M Five-layer Coextrusion Agricultural Film Coating Line - China - Jinming Machinery (Guangdong) Co., Ltd.
On August 21, 2014, Guangdong Jinming Machinery Co., Ltd., (Jinming, stock code: 300281) signed a contract with the Second Product Factory of Tianjin Plastic Science & Technology Group (TPSTG) to produce Asia's first M5N-20000 16M five-layer coextrusion agricultural film coating line. TPSTG is a specialized group that focuses on plastic product processing and manufacturing and engages in industry, business trade and technical R & D. Signing this contract leads the way for new-generation 20M ultra-width agricultural film production equipment being produced in China in the future. 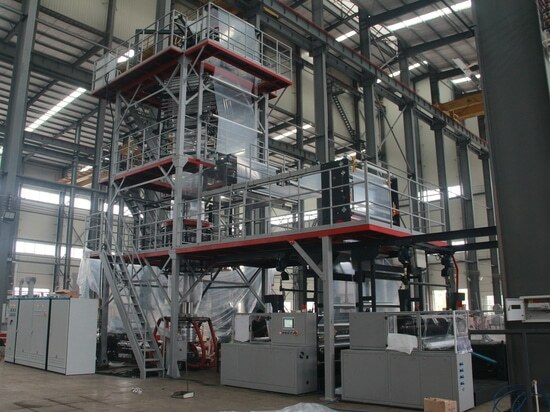 Jinming is a global leading supplier of blown film lines, cast film lines and blow molding lines, as well as the only enterprise in the Asia-Pacific region capable of developing and manufacturing ultra-width coextrusion agricultural film equipment in the agricultural film equipment field. Signing this contract has further established Jinming leadership in the filed of functional film. 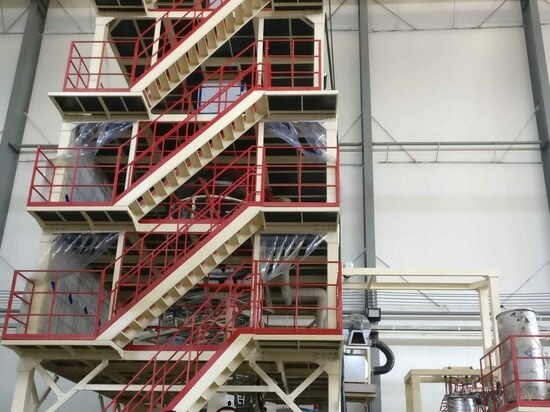 According to this contract, the equipment will be delivered on March 20, 2015, and its core parts will be developed and manufactured by Jinming with German technologies and have a maximum output of 2,500kg/h. 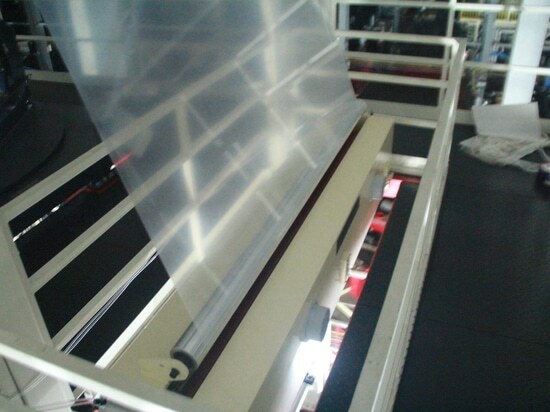 20M ultra-width agricultural films enjoy prominent advantages in increasing operating efficiency of downstream industries and improving the planting environment and space. 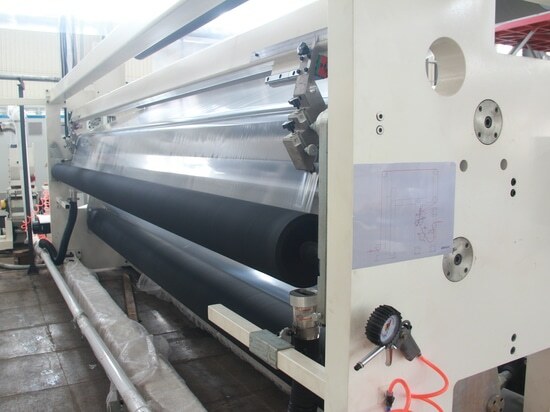 Though many Chinese enterprises expect to enter the field of ultra-width agricultural film equipment manufacturing, only Jinming has stood out in the sophisticated field of the industry due to the complexity of equipment processing and the working instability of equipment. 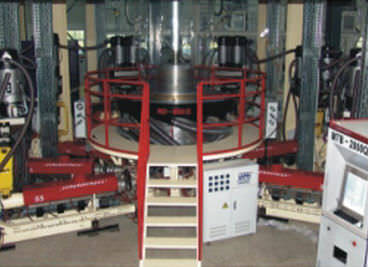 Integrating features of multi-formula resins, five-layer coextrusion agricultural films are characterized by high strength, anti-aging, absence of droplets, excellent translucency and outstanding heat insulation, and are widely applied in farming fields such as greenhouse seedling, vegetable and flower planting and grassland cultivation.